This kit comes with a clear 1.5 V micro bulb, a 1-1/2"L X 1/16" dia. brass tubing piece, a drilled 6mm frosted globe and instructions. 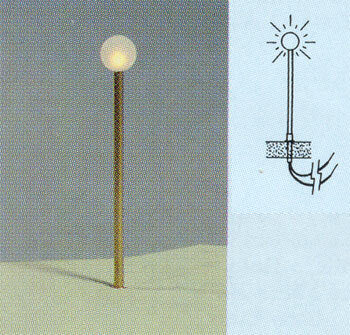 Simply glue the bulb into the globe, run the wires through the brass tube, place on layout and connect to a 1.5V supply. Use on HO thru S scales. The 6mm globe is equivalent to an 18" globe in HO scale. The GRS301 Globe Lamp is the same as the GRS302 except there is no brass rod and the bulb comes already glued into the globe.